Extolling the versatility of the .308 Winchester, this is a great 150 grain hunting round for deer and elk. The Federal 150 grain soft point projectile offers good quality of deformation and hitting power to deliver solid performance on target at moderate distances. The .308 Winchester is an obvious choice for those who want to use sporting rifles for hunting with the wide availability of loads. 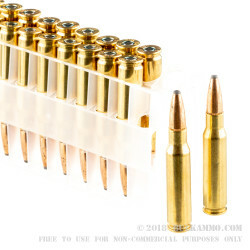 This is a very accurate, well-built cartridge that is known for being reliable and is continually available out of factory because it is extremely popular. This ammunition will easily shoot 1.5 MOA out of just about any mainstream gun and can ensure you have success on a hunt when you are pairing it to the right game and taking a well-placed shot. The 150 grain projectile is more than enough for deer and is in the sweet spot for elk given the static ballistics of the cartridge which are as follows: 2820 feet per second velocity and 2648 pound feet of energy delivery. 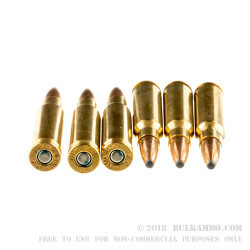 This is a Brass cartridge casing with a Boxer primer which allows for easy reloading and the brass quality is top notch, so it will have several reloadings in it, if treated properly. Q: What is the muzzle velocity/energy of this round? Thank you, greatly appreciated! Posted On: 6/27/14 By: Juan Tenorio Jr.
A: Hello Juan, These 150gr. SP rounds by Federal in .308 have a muzzle velocity of 2820 fps. and a muzzle energy of 2648 ft.lbs. They make great target and hunting rounds for a .308 firearm.